Each top is 1400w x 760/600d mm. Slightly shallower than normal allows more space. 6 1400 x 1000/760mm tops available. Still large enough to use with two monitors. 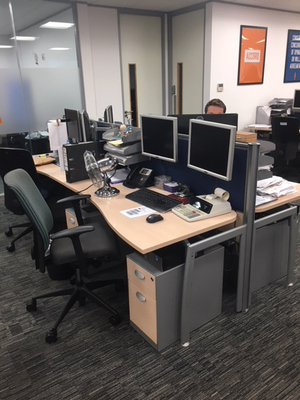 Screen mounted monitor stands for £40+VAT each. Maple MFC, blue or green fabric screens. Silver metal legs and uprights. 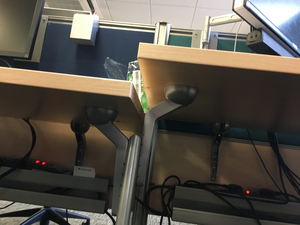 Possible to set height of individual desks. Block of two - £250+VAT. Block of four - £400+VAT. Block of six - £550+VAT.